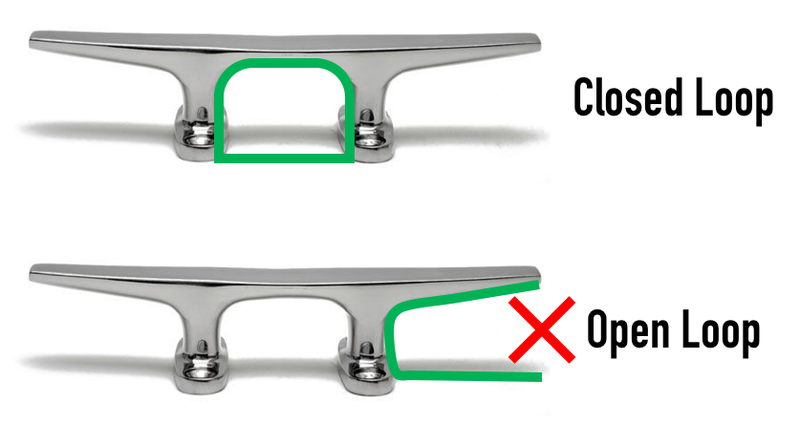 For reference, a “closed mounting point” means a point where the buckle-loop, which makes up the end of the mounting straps on the S2 MoorShade cover located at the two boat-side corners and the center lifting point, cannot be removed while the male and female ends of the buckle are connected, meaning four closed sides. See Figure 1 as an example. Floating anchors MUST be mounted loosely (no less than 18 extra inches of webbing from a length where there is no slack). This is so that the cover is able to move with the boat if the boat rocks back and forth in waves. Improper installation of the floating anchors may result in bodily injury or damage and/or loss to the cover, components, accessories, or the vehicle/object that the system is mounted to, for which you, the buyer, are responsible. Use of the S2 MoorShade as anything but a sunshade is strictly prohibited and you, the buyer, accept full responsibility for any damages, loss, injury, or even death caused by improper use. Some instances of improper use are stated below. If anything happens to fall onto the cover, safely uninstall the cover from the side of the boat and remove the object from the cover, then reinstall following recommended mounting procedures. The S2 MoorShade is NOT a hammock, or in any other way is it designed to bear the weight of a person to stand, sit, or lay on and could result in injury and/or death or damage and/or loss to your personal property and/or property owned by another person or entity. Prior to installation, all mounting points must be inspected and verified to be a secure mounting point. If there is any question to the soundness of the desired mounting point, do NOT use it as a mounting point until it is further inspected and/or replaced. Prior to installation, the boat MUST be stationary and turned off whether at anchor, tied securely to a stationary object (such as a dock), tied securely to another boat, or anchored while beached at a sandbar or other similar docking point. NEVER install the S2 MoorShade on a moving object or on a boat that may be put in motion. If the S2 MoorShade is installed on any object, movable or stationary, other than a boat, that object MUST be parked, anchored, or secured to be stationary and not move during the time that the product is installed. The S2 MoorShade MUST be installed downwind so that, while the floating anchors are not attached, incoming wind will not blow the cover towards the boat and potentially cause damage to the cover or other property or cause physical hard to nearby individuals. Proper use, broadly stated, is that the S2 MoorShade is, as previously stated, to be used as a sunshade which extends outwards from the side of the boat while mounted from three secure mounting points at the boat plus two connected points at the floating anchors and held together with four locked-in-position frame poles. Any improper use of Shade Squared products, accessories, and/or components not explicitly stated is implied and considered a deviation from proper use, and you, the buyer, accept full responsibility for any incident. By completing this order, you, the buyer, understand that Shade Squared LLC is not responsible for ANY damages due to improper use, including bodily injury or death that may occur.